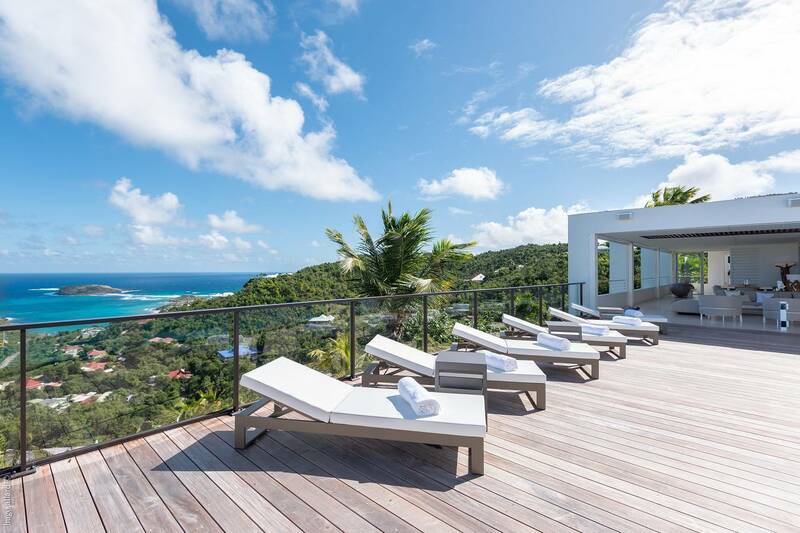 Dream About: Gathering with family or friends to relax and swim in the heated pool, share Caribbean views and dine under the stars. 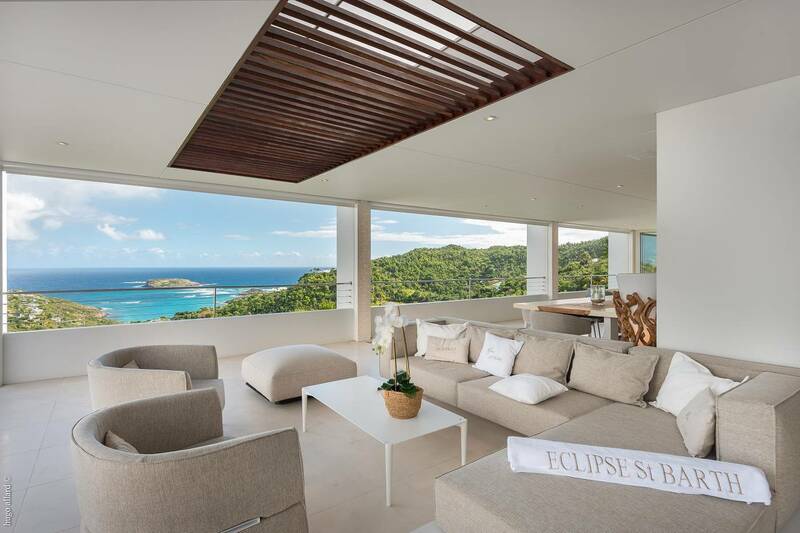 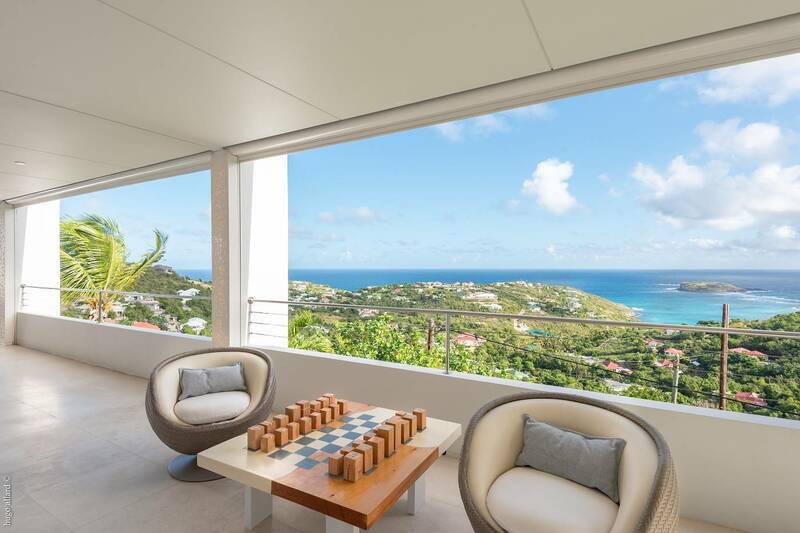 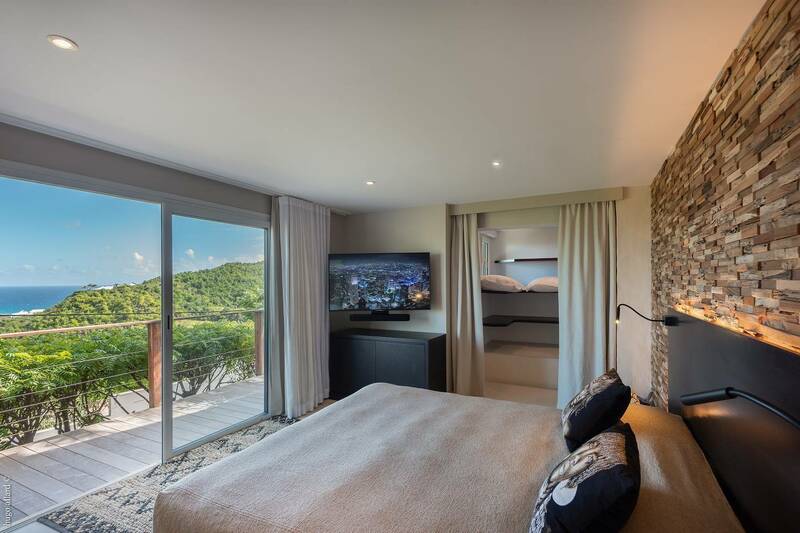 Villa Eclipse’s hillside location in Camaruche affords a panoramic view of the countryside and the sea, and puts guests in vacation mode as soon as they arrive. 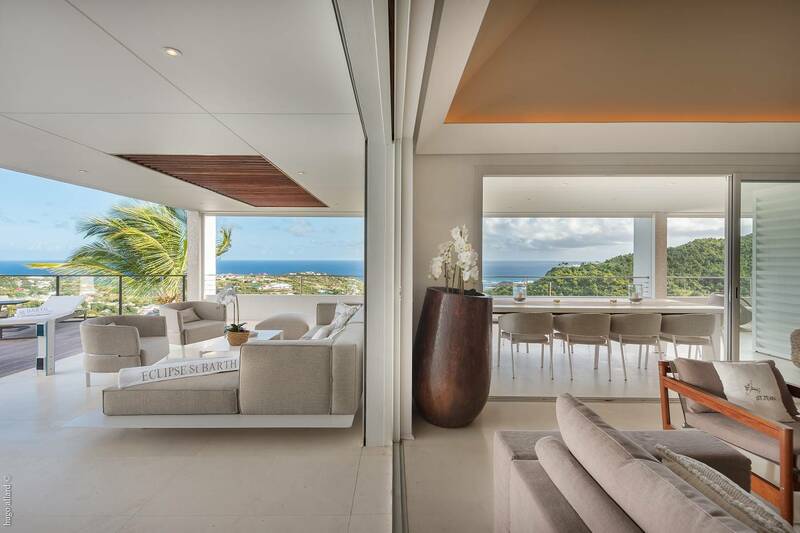 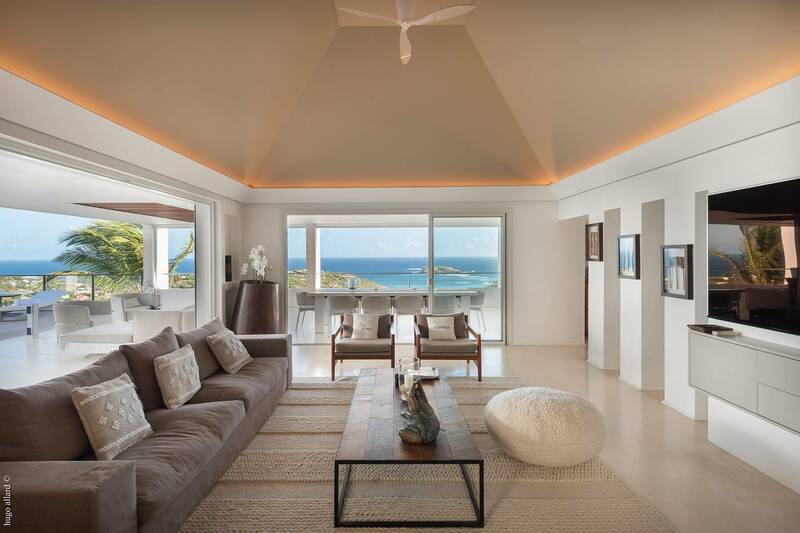 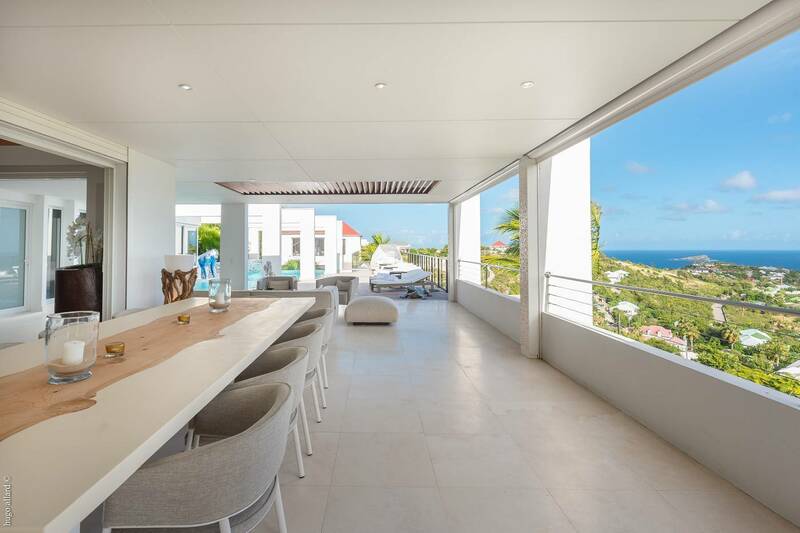 Architecturally striking with contemporary chic décor, this six bedroom villa offers expansive and comfortable indoor and outdoor living and dining spaces, a stunning infinity pool (heated in winter) and a wealth of other features that are sure to please including central air conditioning. 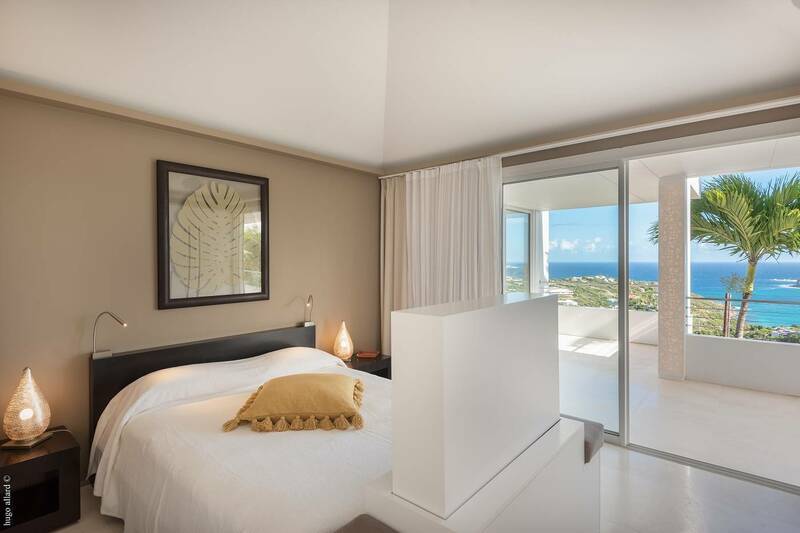 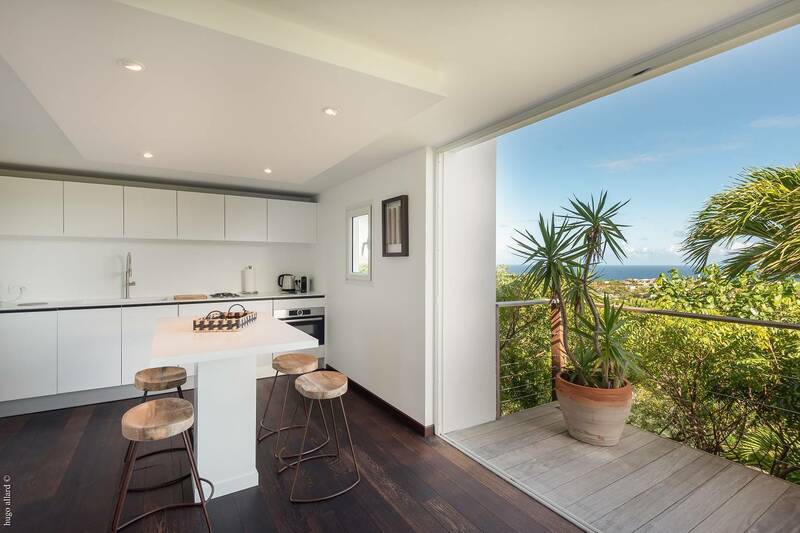 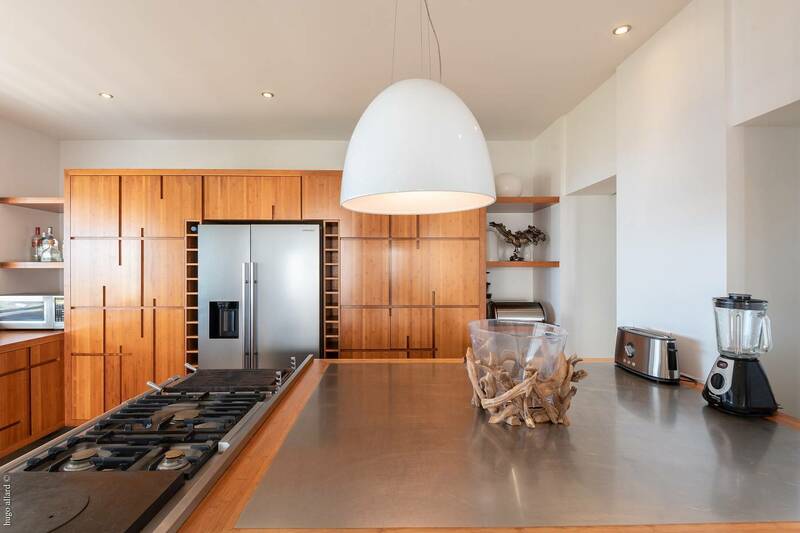 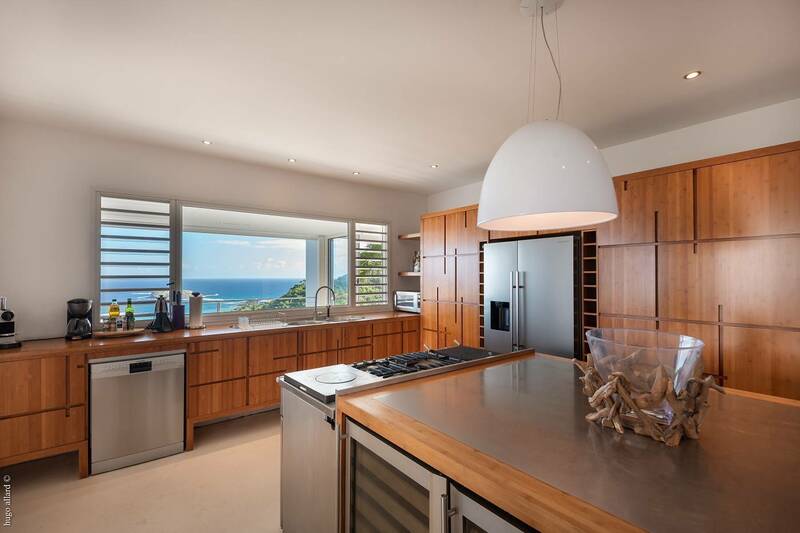 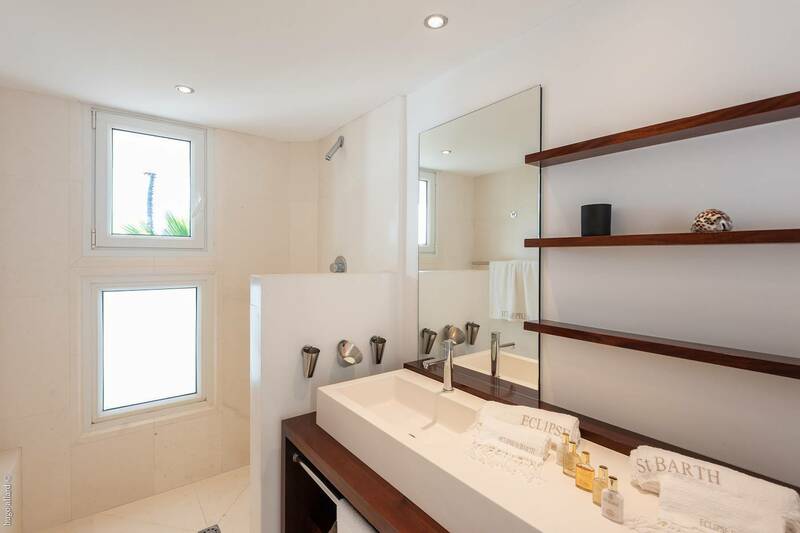 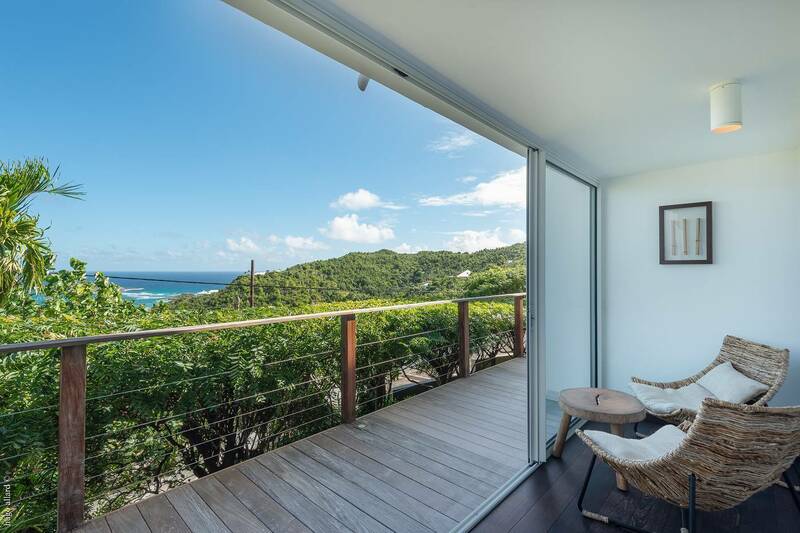 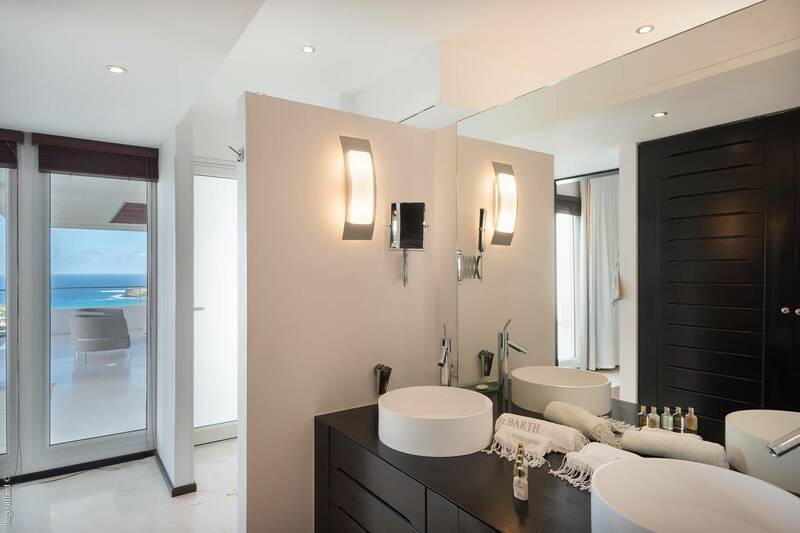 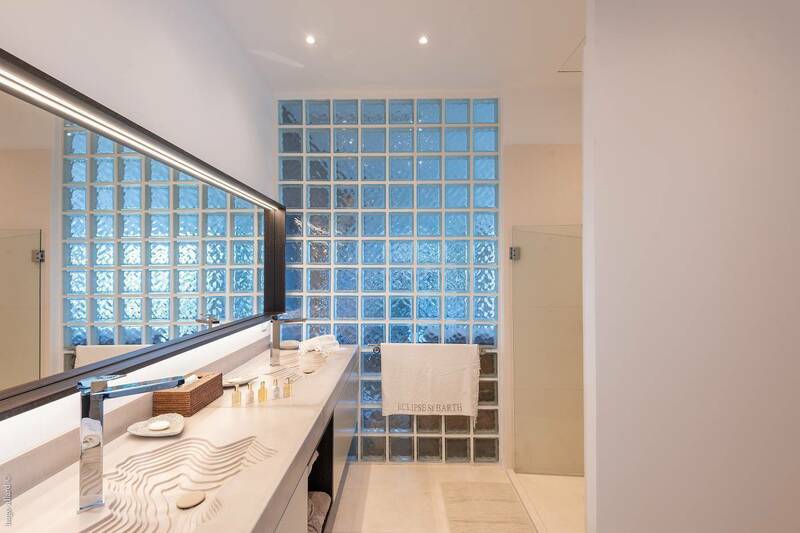 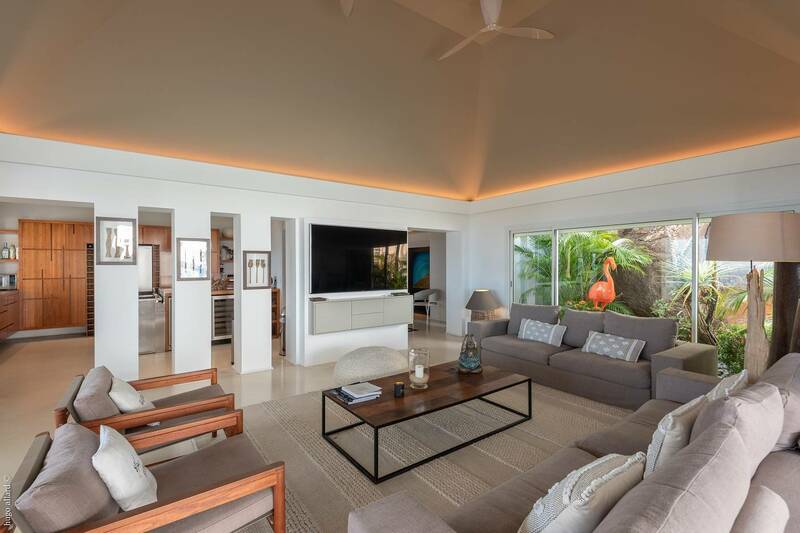 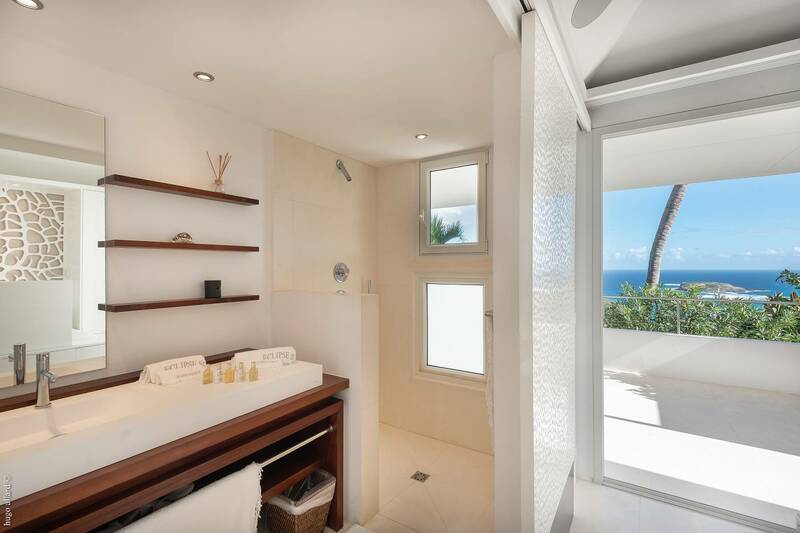 The sleek stainless and teak kitchen is outfitted with every amenity and would fit the needs of a professional chef; there’s a guest bath, lush tropical gardens and a mini-gym. 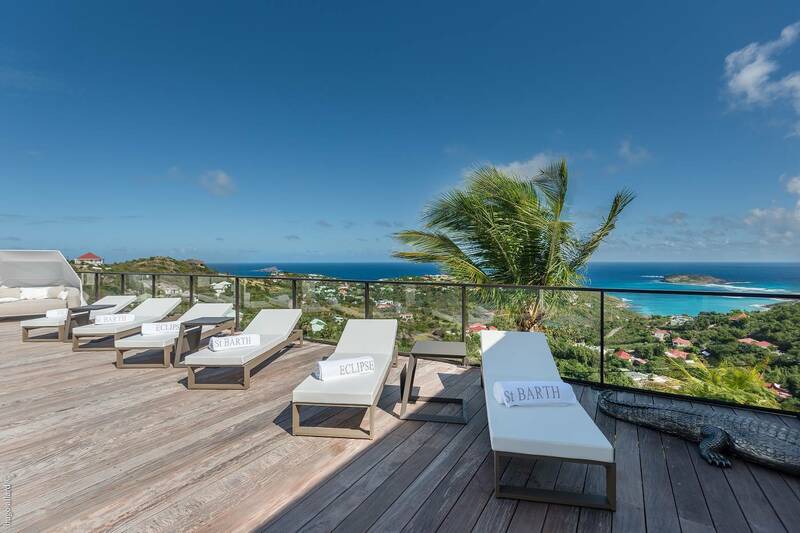 A steep rugged path leads up to a hilltop deck where guests can see the sunset. 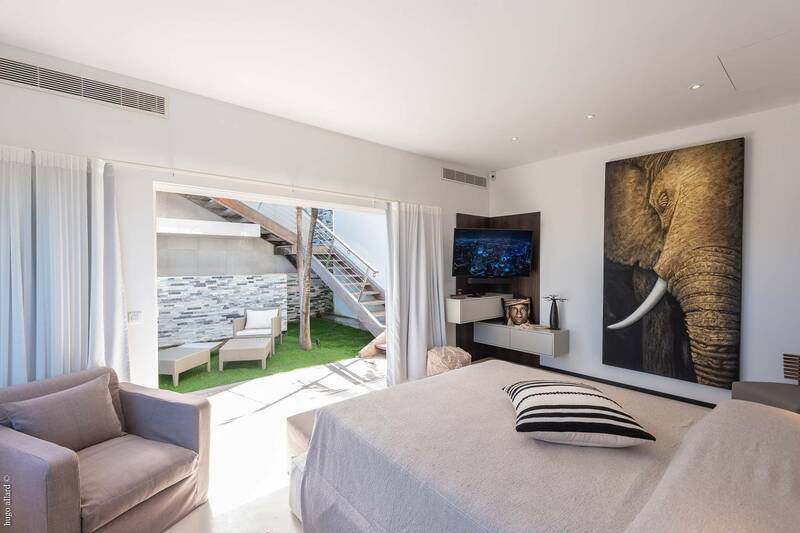 The villa’s six bedrooms, five of which have en suite baths, include a king-bed master suite with a sitting area and a dressing room. 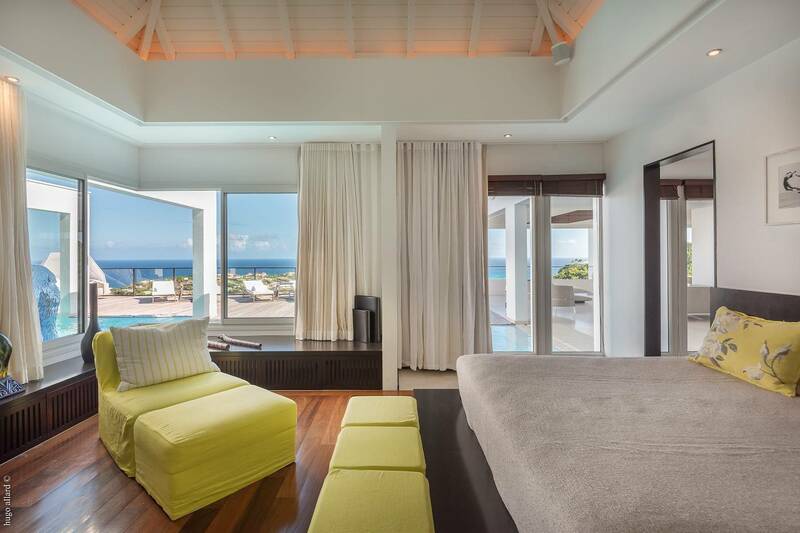 Two smaller serene double bedrooms are located by the villa’s main entrance. 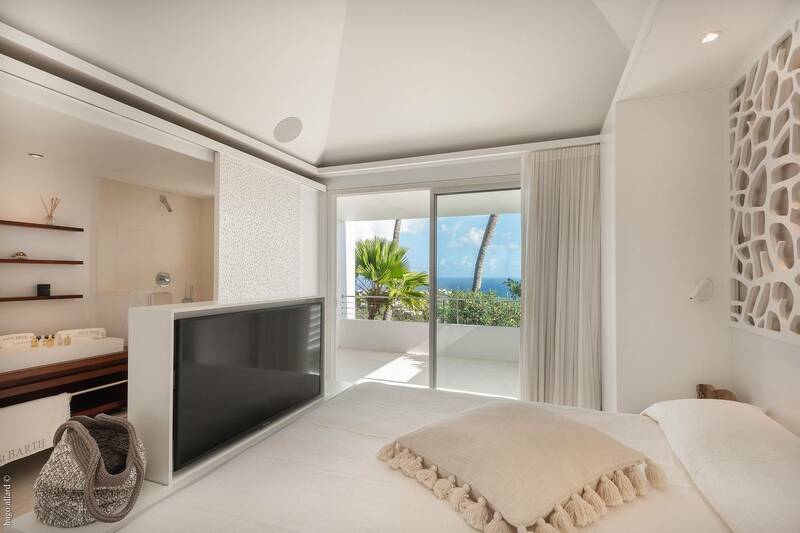 There are two king/twin-bedded rooms on the villa’s lower level; one is an independent studio with its own kitchenette and the other opens to a lovely cacti garden with a sitting area. 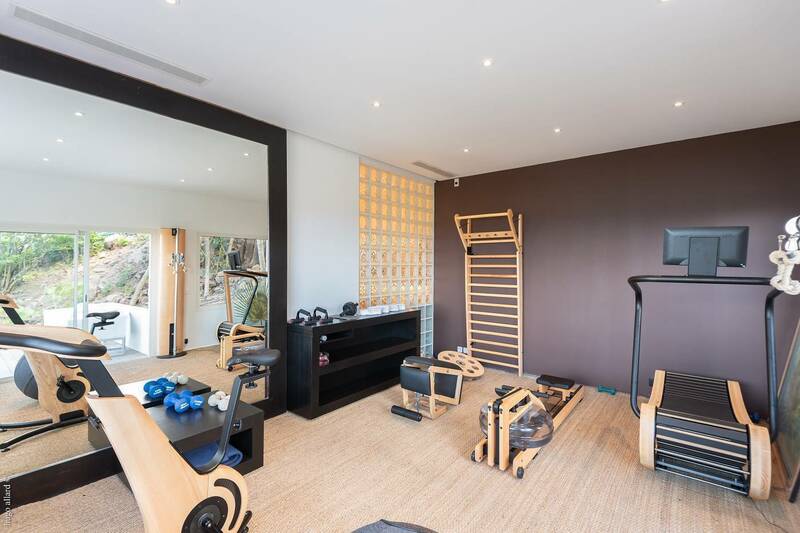 (The mini-gym is located off of this room.) 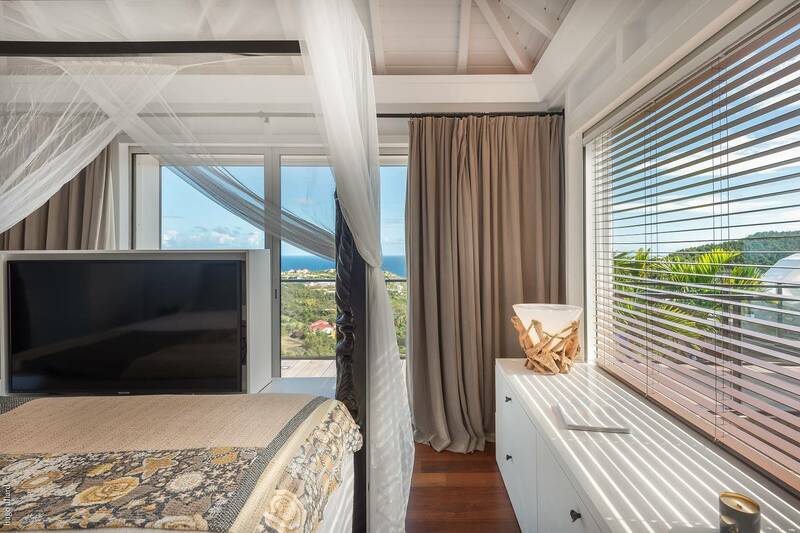 A traditional Creole "case" houses another king bedroom with a beautiful 4 poster bed. 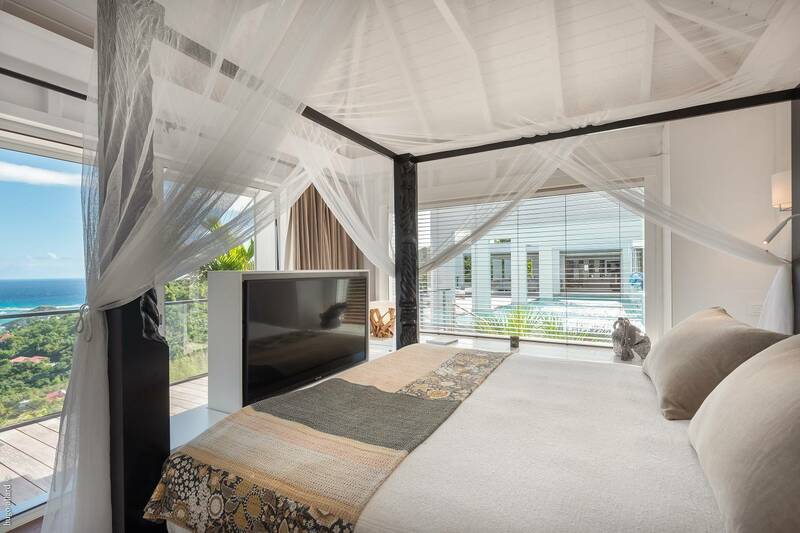 Note: this bedroom is not en suite and has its own air conditioning unit. 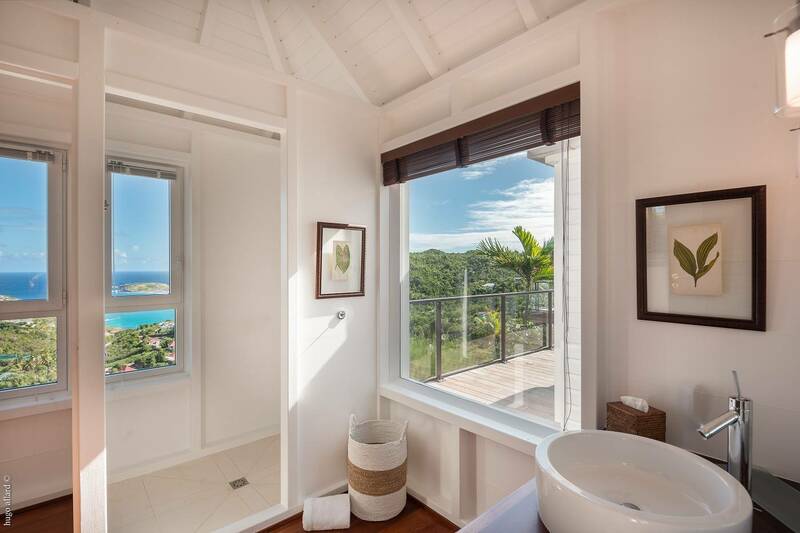 The bathroom is an adjacent bungalow. 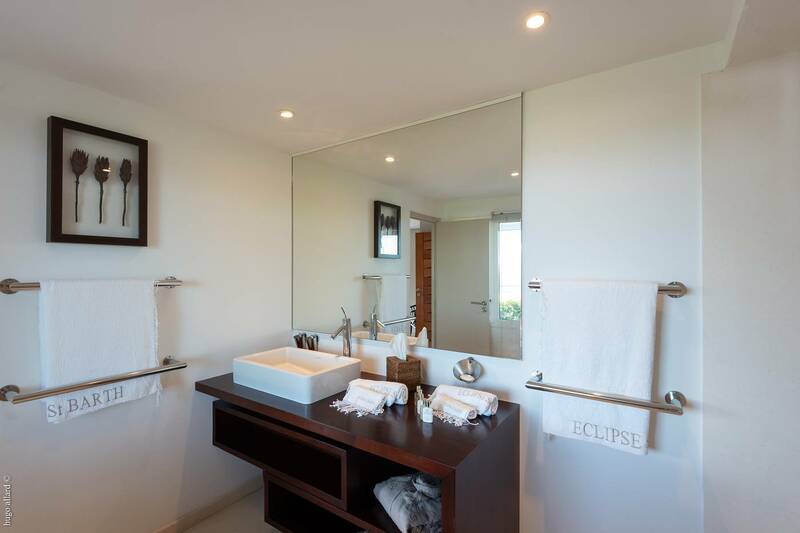 Villa Eclipse is a perfect choice for a gathering of a large group of family and friends. 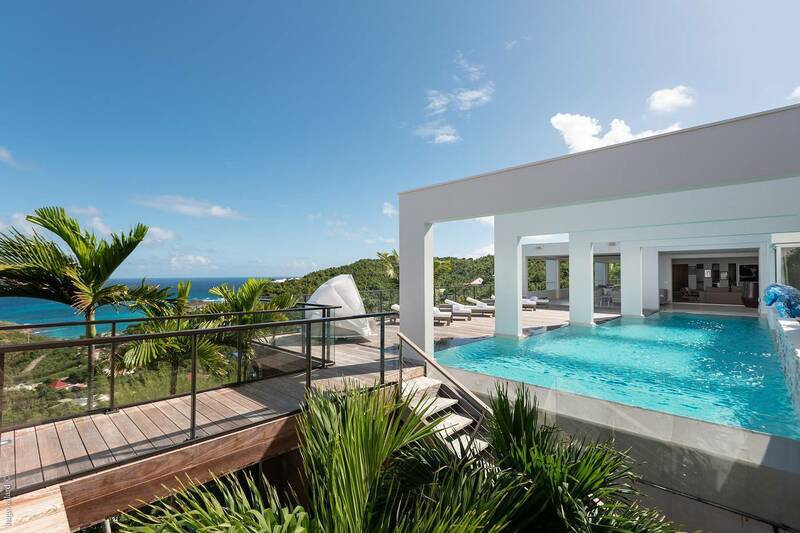 The spectacular heated swimming pool. 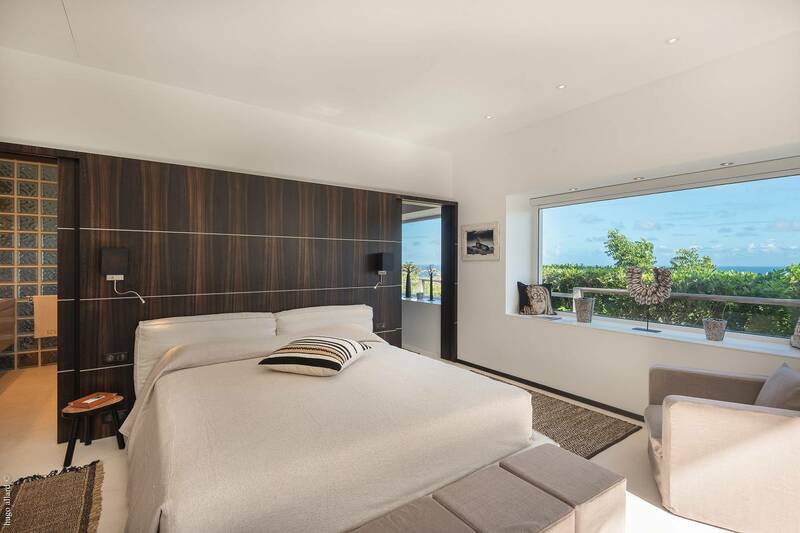 It has 6 bedrooms (5 en suite), a chef's kitchen, loads of indoor and outdoor space and a mini-gym.